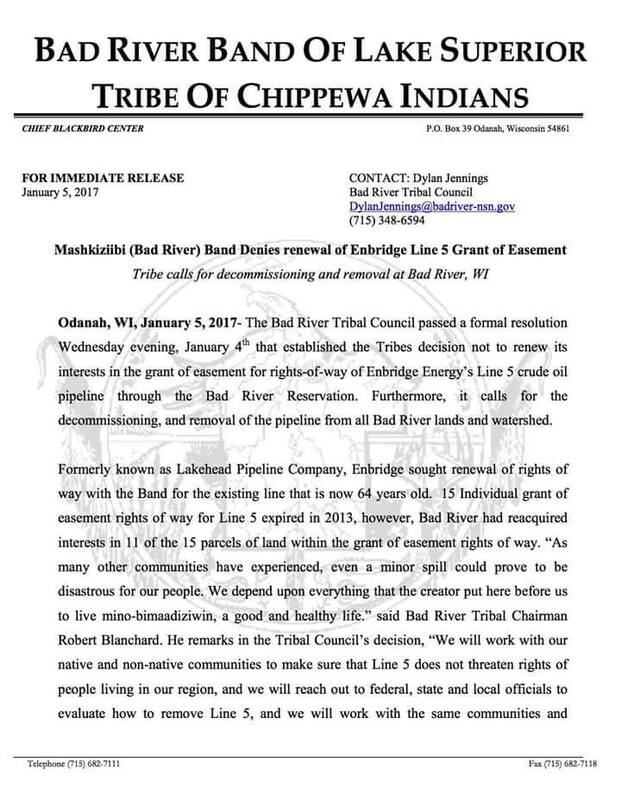 Odanah, WI — In a spectacular act of resistance to Big Oil, the Bad River Band of Lake Superior Tribe of Chippewa Council refused to renew a right-of-way easement for an Enbridge crude oil pipeline running through the Bad River Reservation. While Standing Rock Sioux Tribe members remain entrenched in a battle to stop the Dakota Access Pipeline, the Bad River tribal council passed a formal resolution against renewing rights-of-way for Enbridge’s Energy Line 5 — and officially called for the pipeline to be decommissioned and removed from all tribal lands and the affected watershed. Originally known as Lakehead Pipeline Company, Enbridge installed the pipeline in 1953; however, by 2013 — when “15 Individual grant of easement rights of way for Line 5 expired” — Band River had reacquired interests in eleven of those parcels. Blanchard explained the resolution had not been motivated solely by the Band’s concerns — rather, the well being of the region, as a whole — all inhabitants as well as the living environment. “We will work with our native and non-native communities to make sure that Line 5 does not threaten rights of people living in our region, and we will reach out to federal, state and local officials to evaluate how to remove Line 5, and we will work with the same communities and officials to continue developing a sustainable economy that doesn’t marginalize indigenous people,” Blanchard stated. Not wasting any time, the Band has already begun planning for Line 5’s disassembly and removal, taking into account the handling of hazardous materials and remnants of toxic crude. Disposal of the pipeline parts, recycling and disposal of hazardous contents, and restoration of the land to as pristine a state as possible — with minimal impact on the ecosystem — are now of primary concern. Where the Bad River Band holds a distinct advantage compared to the Standing Rock Sioux in its fight to protect the water and land perhaps most concerns the location of the pipeline. Energy Transfer Partners plans for the Dakota Access Pipeline directly threaten the water supply of the Standing Rock Reservation — but the pipeline’s path under the Missouri River’s Lake Oahe reservoir lies just north of government-declared tribal lands. This means the majority of project in the area traverses private property, which ETP can pay owners for the right-of-way — usually paltry sums forcing them into court battles over valuation — or, as it has done in many places, performed gymnastics to employ the U.S. government’s controversial land-grab policy of eminent domain. 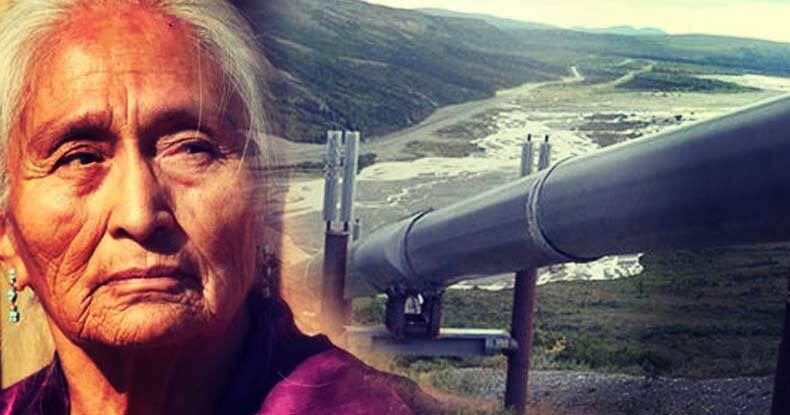 While the Enbridge pipeline obviously already sits on Bad River Band property — making the comparison a bit of apples and oranges — the fact it runs through reservation lands provides the members of the sovereign nation greater muscle in such decisions. As this resolution just passed in the later hours on Thursday, a response from Enbridge had not yet been released. Standing up to Big Oil — thanks to opposition in Standing Rock — has become a national and international movement to begin the necessary move toward renewable forms of energy production. Constant spills, leaks, and explosions — many with disastrous consequences — go mostly unnoticed in headlines simply for their frequency. 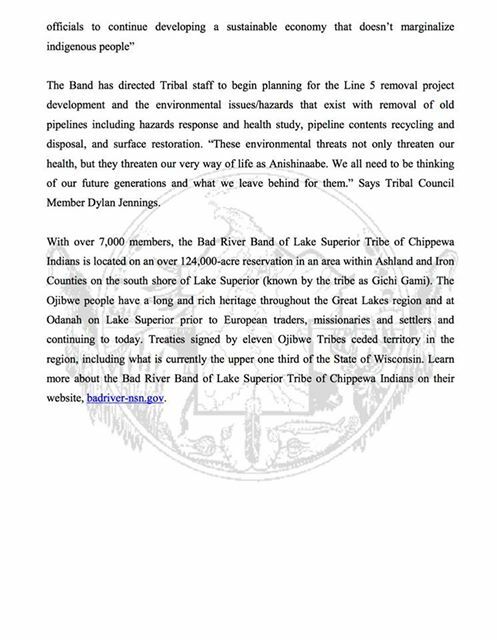 For the Bad River Band of Lake Superior Tribe of Chippewa council to sound a collective halt to Big Oil’s dominance of their land is an admirable — if quiet — act of resistance, indeed.